Construction and Maintenance, for 1974. AAPA is a national association whose membership is comprised of most major ports in the country. Management personnel serve on various AAPA committees which decide policy and planning valuable to member ports. Committee IV, one of the most prestigious com- mittees of AAPA, has the responsi- bility of preparing a handbook covering construction, maintenance and general operational procedures of a port. Terminal and Seaway Piers) locat- ed on Fuhrmann Boulevard. Dur- ing this time, the property has been renovated, improved and developed into a first-rate facility. A fair share of the credit for this effort should be given to Mr. Finnegan. A veteran marine construction diver and contractor, as well as a licensed Coast Guard captain, Mr.
Finnegan has brought a wealth of waterfront knowledge to the opera- tional aspects of the Port of Buffalo. Center will be used as an informa- tion office to provide U.S. business- men with full information on Soviet goods for export, particularly ma- chinery, industrial instruments and equipment, and raw materials. At a lease signing ceremony held at the World Trade Center, Mr.
Bessmertniy said: "The signing of this contract for setting up an in- formation service for Amtorg will contribute to the promotion and strengthening trade relations be- tween U.S.A. companies and Sovi- et foreign trade organizations, and involving a great number of Ameri- can companies in trade contacts with Soviet trade organizations." Trade Center will naturally play a leading part." Government organizations are now doing business at the Trade Center. Amtorg Trading 'Corporation was established in New York in May 1924, to consolidate the representa- tion of Soviet agencies handling trade between the United States and USSR. Amtorg also maintains an office at 355 Lexington Avenue in New York City. If it's steel, Bertie Spell understands it. He ought to. Bertie Spell is good at his job, and he's only one of a whole crew of good men. Plus this is a good town, and the weather's good year 'round. Come see us. Whether you need voyage repairs or a major conversion, Bertie will see you get a super job. 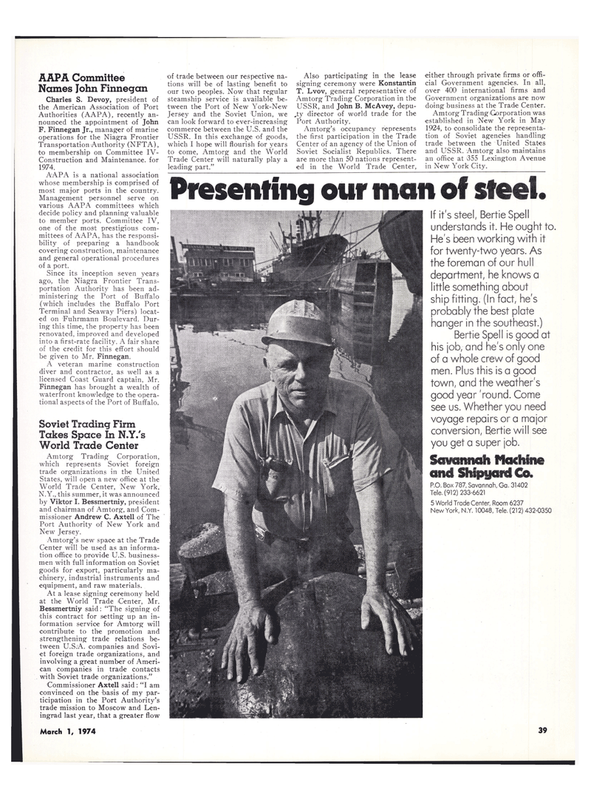 Savannah Machine and Shipyard Co.
Presenting our man of steel.